Dr. Sarah Guthu is a creative midwife, who specializes in bringing others' dreams to fruition. She works as a professional fundraiser, writer, editor, marketing consultant, and strategic planner. An outspoken defender of the importance of health, balance, and support for the productivity of professional artists, she hopes to one day run an artist's retreat, where her hearth magic can nurture young artists in body and spirit as they launch their careers. She is currently working with her soulfriend Dr. Amal Eqeiq on an illustrated book of Eqeiq's poetry titled Diaries of a Hedgehog Feminist. In September the days stretch themselves to gossamer, a mere film of the syrupy heat August poured upon us. The light wanes to silver in the weakened afternoons and the mornings darken as we track the sun southward along the horizon. In the air the first chills, not yet damp, calls to us with the mournful song of wild geese. I was a small child when I read Jane Langton’s The Fledgling, an ode to wild things and humans’ place in the web of the world. Thoreau’s On Walden Pond hums steadily through this book, a touchstone. It would be decades before I read Thoreau, but I never looked at the wild geese the same way again. I used to draw them obsessively, in shades of black and grey and white charcoal – and gold, always gold, the soft light of the setting sun that gilded their soft bellies and necks with the light of the setting sun. I close my eyes and I still see them that way, a line forever fixed against an autumn evening sky. Or rising before dawn in the fog that spread like thick butter across the river to the hills, unseen but heard, as the sky paled and brightened. I’d often wake early and walk out to the fields to watch the sun rise as a child. If it was August or September, I knew by the time I got home my mother would be pulling a blueberry coffee cake out of the oven, warm and fresh. She’d cut thick, soft chunks of it for our breakfast, crumbles of sugar topping dusting our plates. This is that cake. Autumn is the season of memory, and for me this cake is forever tied to that momentary suspension between-times - those brief golden weeks when the heat has gone out of the summer but before the rains come, those days that seem to invite us so cordially to contemplate the elegance of existence. Over the years I’ve changed the recipe up a bit – made it vegan, pared back the sugar, traded the blueberries for blackcurrants. But I promise you, it is particularly good stuffed full of whatever wild berries or hedgerow fruits grow near you – catch them now, slightly dessicated and dusty, their flavors rich and sweet from their long ripening. As you pull it from the oven, this cake passes through three generations of women of my family into your hands. We bid you welcome to our table, to morning, to communion, to a quiet moment at the pinnacle of season’s change. Outside, the wild geese are calling, calling, calling the way home. Grease and flour a 9” square baking pan. Or, to make this special, I like to use a springform pan, which makes it easier to make a nice presentation. In a small bowl, make the crumb mixture: rub all ingredients together between your fingers, or press and mix together with a fork until evenly mixed. The texture should be like wet sand. *I like to use a mix of allspice and nutmeg with blackcurrants in this cake, but see below for other ideas. Set crumb mixture aside. Now it’s time to make the cake: in a medium mixing bowl, whisk together flour, baking powder, salt and spices until evenly combined. Set aside. In a large mixing bowl, mix together sugar, coconut oil (or butter), and egg (or egg replacer). Add the almond milk (or other milk) and stir to combine. Now add the flour mixture to the wet ingredients and stir to mix well. Gently fold in your berries. Pour batter into prepared pan, smoothing top. Sprinkle crumb mixture evenly over the top of the cake batter. Bake 45-50 min, until a tester poked into the middle of the cake comes out clean. Don’t be afraid to throw in berries that are a little dried out and wrinkly; they’ll be extra sweet from summer. Try pairing them with cardamom or allspice in the cake, and use a touch of cloves (just a little) with cinnamon in your crumb mixture. These ornamental crabapples are as edible as varietals grown for eating, but their fruits are smaller and tarter; some of them have an intense tannic bite, which I love. It takes a bit of time to remove the tiny cores and seeds, but the flavor is fantastic, especially in a baked dish like this. Substitute a mix of cinnamon, nutmeg, and cloves for the cardamom, and put allspice in the crumb. An autumnal classic! Huckleberries. These are the evergreen variety, but the deciduous shrubs (both red and blue) are also delightful. Use cardamom in the cake and a 50-50 mix of allspice and cloves in the crumb mixture for something warming and deep. Mahonia has a deep, concord-grape flavor with a wild, earthy edge. However, do note: it should not be eaten by anyone who is pregnant or nursing! 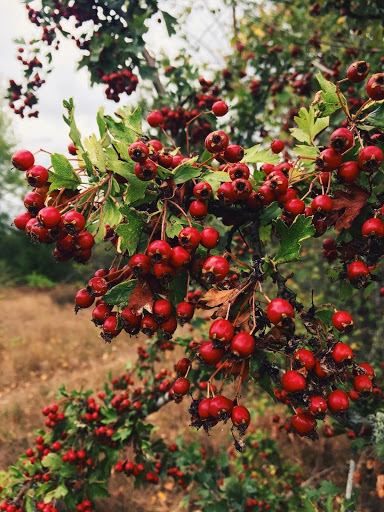 The fruits of the Oregon Grape have a big seed, so be prepared for a crunchy bite if you bake the cake with these. Consider using allspice and a touch of clove in the cake, and try poudre forte in the crumb mixture for an exciting tang to balance the rich flavor of the fruit. Try picking and adding haws to your cake after the first frosts have sweetened the haws. They don’t have a strong flavor, so consider mixing 1 cup of haws with 1 cup of another kind of fruit – fresh or dried cranberries would be delicious. Use ginger in the cake and cardamom in the crumb mixture. These rugosa rosehips are a lovely source of vitamin C – and, like the haws, are really best harvested after a frost. However, be aware that each seed in the rosehip contains a little hair that will irritate your skin as well as your insides if you accidentally ingest them. Wear gloves and carefully cut the fruit open, removing all seeds and hairs. Wash the fruit carefully then cut into berry-sized chunks before baking. Rosehips would be lovely with a bit of ginger and some freshly grated lemon zest, with a nutmeg crumb. A note from the Editrix: All photos and writing belong to Dr. Guthu. Do not use without permission. Violators shall feel our wrath.